3-layer functional overall which is CE certified for protection against High Pressure Cleaning. 3-layer functional overall which is CE certified for protection against High Pressure Cleaning. Excellent for the toughest conditions! Lined for high comfort. Water- and dirt repellant outside. Openable ventilation in the armpit, waterproof cuffs, adjustable hood. (See more details right.) Use in combination with Gloves and Boots, see page 7. Weight 2.5 kg / 5.5 lbs. Special pocket for phone (waterproof). Protection on the entire front and head. Protected areas identified by stripes. 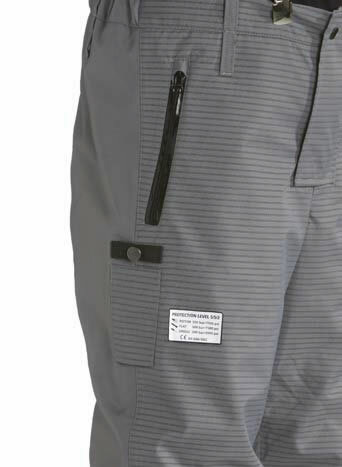 Leg pocket with water proof zipper on left leg.